Disability Blog Carnival #74 is up NOW! Go have a read at Through Myself and Back Again, where Lilwatchergirl has assembled a good collection of links around the theme of "Participation." This edition of the carnival has "previews," little clips from each linked blog post, so you can get a taste before clicking through to the whole post. Next edition of the Disability Blog Carnival is #75, and will be hosted by Emma at A Writer in a Wheelchair. Emma also hosted the 50th edition of the Carnival, so it makes some kind of sense that she's back for this milestone--and hey, the theme of her edition is....Milestones! Click over to read her invitation and instructions, then plan to participate (!) before the March 25 posting date. Wow, so two years after I first wrote about this, Cerrie Burnell's arm is still a matter of controversy? Maybe because I'm also reading Sue Schweik's The Ugly Laws right now, it seems amazing that in 2011 we're still anxious about the sight of an arm that doesn't end in a hand. For recent blogging about Cerrie Burnell's story, see Planet of the Blind and Bess's The Right to Design, among others. 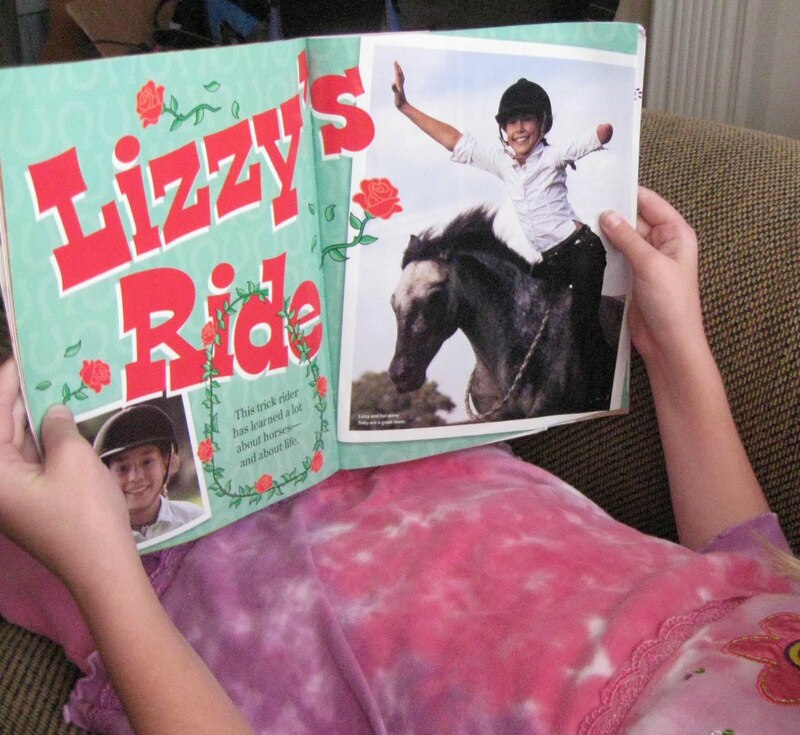 "Lizzy's Ride" is a six-page first-person story about a Pennsylvania girl who rides ponies in competition. Lizzy says "I was born with only one hand. It might seem like that would be a big deal, but it's really not." The story isn't about her arm, it's about her ponies and how she cares for them on her family's farm. (There's video of Lizzy riding on the American Girl website.) But clearly, the editors at AG don't think that such things should be kept under wraps, either. 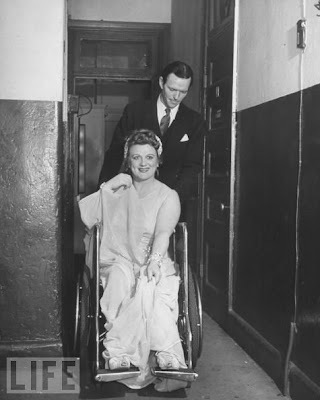 Born on this date in 1907, Australian soprano Marjorie Lawrence (show above in her wheelchair, smiling in a hallway for LIFE magazine; a man stands behind the chair; they appear to be dressed for a formal event). Marjorie Lawrence was a noted performer of Wagner heroines. In 1941, while appearing in an opera in Mexico, she contracted polio. Eighteen months later, after treatment with Sister Elizabeth Kenny, she returned to the stage. 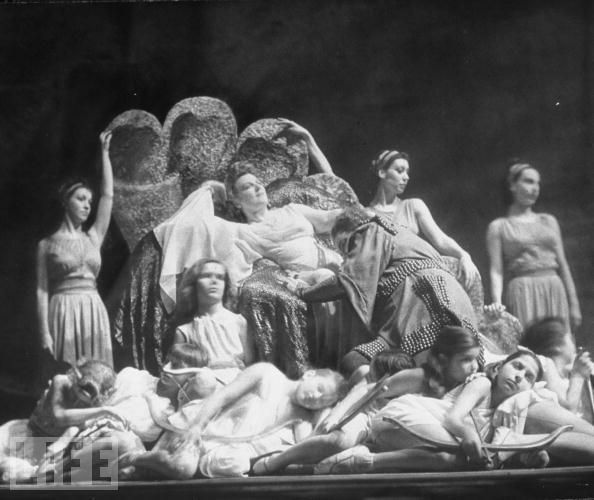 Lawrence generally performed in a seated or reclining position thereafter, with creative staging that incorporated her stance into the visuals. The photo below, also from LIFE magazine, is from a performance by Marjorie Lawrence after polio (she played Venus--shell and all!). She taught after she retired in 1952, near her home in Hot Springs, Arkansas, until her death in 1979.